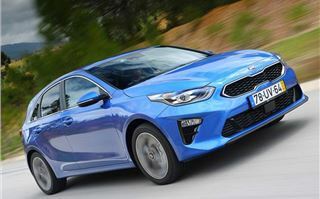 This is a test of the 2018 KIA Ceed 1.4 T-GDI 7-DCT. And an update of Ceed specs and prices now that the range is tested to EU6d TEMP / WLTP emissions standards. 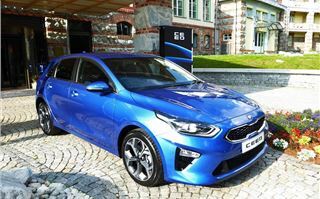 All other drivetrains of the 2018 KIA Ceed: 1.0TGDI, 1.4TGDI manual; 1.6CRDI are tested previously here. 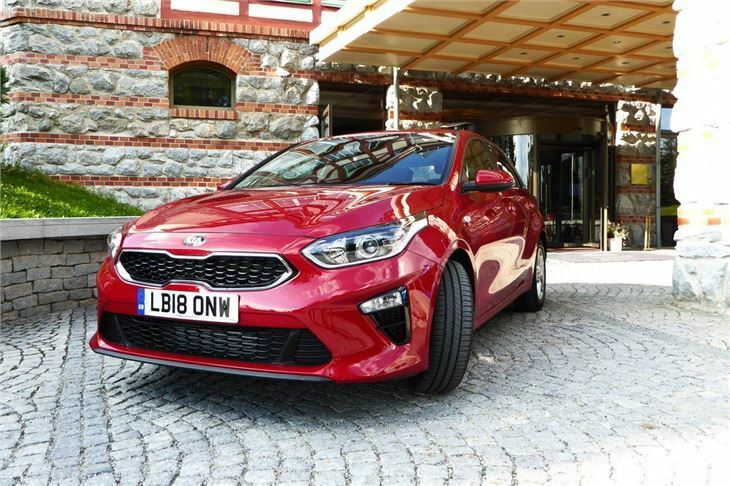 As is often the case on a car launch, automatics were not available for the first phase and this is an opportunity anyway to bring you the latest information. 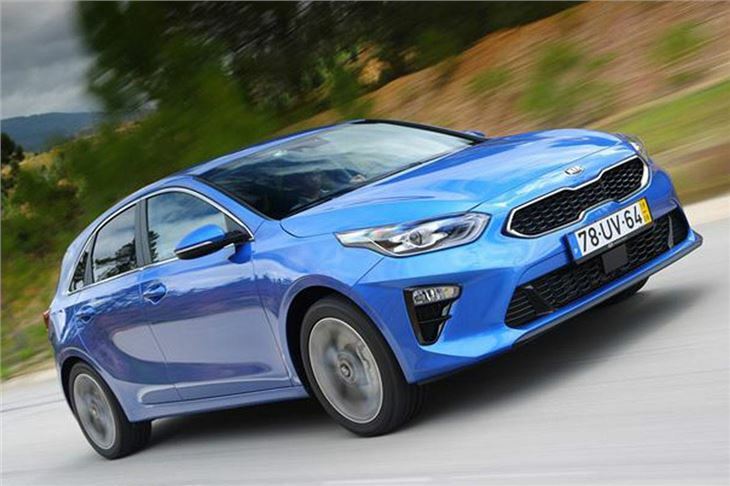 KIA’s 7-DCT is a twin dry clutch transmission, which, unlike VAG’s DQ200 7-speed dry clutch DSG and Ford’s 6-speed dry clutch Getrag Powershift, has not been an automatic fearbox. We have received very few complaints and one particularly fastidious readers is delighted with his cee’d 1.6CRDI 7-DCT. The 1.4 T-GDI 7-DCT is available in two trim levels and the top spec ‘First Edition’ version we drove is listed at £26,850. 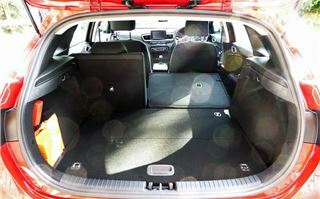 It is literally loaded with kit: satnav, reversing camera, Smart Pack Assist System that integrates front and rear parking sensors with the ability to self-park, Smart Cruise Control with stop and go functionality and Drive Mode Selector, black leather seats with contrast stitching, heated and ventilated front seats, Heated outer rear seats, 10 way power adjustable driver’s seat with memory, Wide electric tilt and slide sunroof with automatic roll blind, LED bi-function headlights and cornering lights. You get the picture. The new Ceed (note the change of spelling) sits on Hyundai/KIA’s new ‘K2’ platform. It is 20mm wider (1,800mm) and 23mm lower (1,447mm) than the previous cee’d. 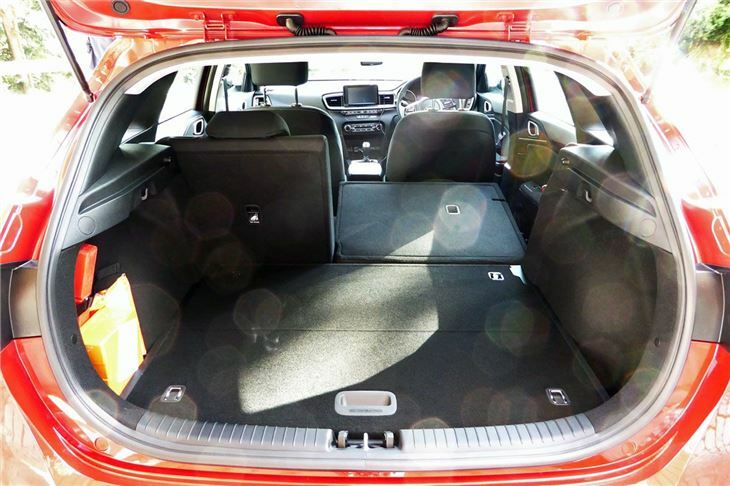 Its wheelbase remains the same at 2,650mm, and it has a 395-litre boot, as well as more shoulder room for rear passengers, more headroom in the front row, and a lower driving position. Suspension is fully independent for a smoother ride and better handling than twist-beam rear axles. For the UK there are 11 versions based on four trim levels: ‘2’, ‘Blue Edition’, ‘3’, ‘First Edition’, priced from £18,295 to the £26,850 1.4 T-GDI 140 7-DCT First Edition driven here. The cabin impresses with sensible, ergonomic design and high quality soft-touch materials. The dash is dominated by a floating 8-inch touchscreen with plenty of information also imparted by a 4.5 inch TFT information screen between the speedo and rev counter. 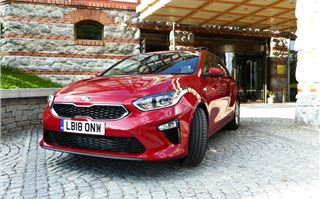 The previous cee’d wasn’t a bad handler, but, faced with competition such as the new Ford Focus, KIA has developed the suspension to keep keen drivers happy without upsetting passengers with a jiggly ride. Whether on 205/55 R16 tyres or 225/45 R17s it smooths out imperfections in the road surface very well indeed. 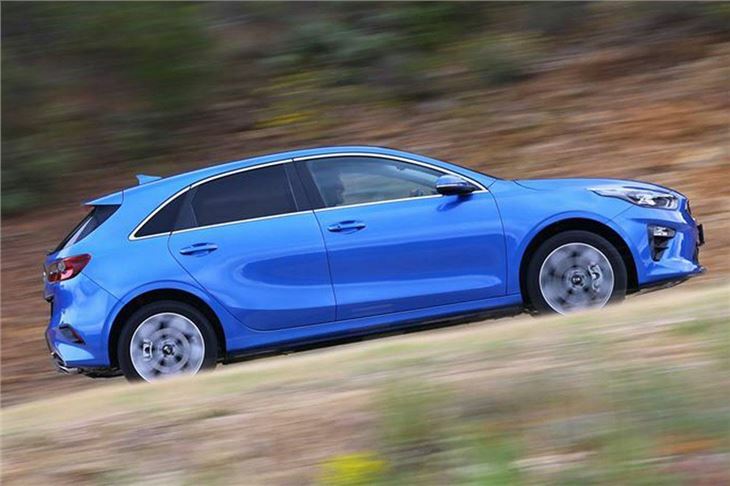 Definitely up to Mazda 3 standards, if not quite as sporty, while roadholding round long bends is completely assured. We have no quarrel with the dry clutch 7-DCT. Left alone, it picks its ratios well, doesn’t change gear half way round corners and, unlike some other dual clutch autos, takes off smoothly in traffic. 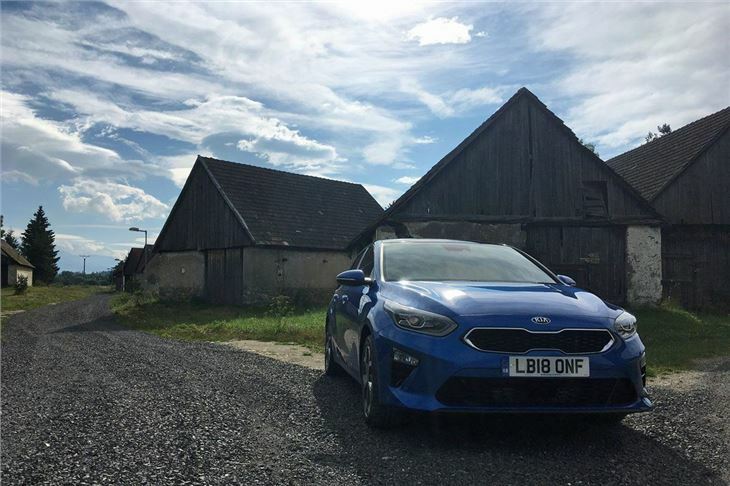 7th gives about 32mph per 1,000rpm and we averaged 48mpg over a mix of mountain and country roads, motorways and town running. As well as seven airbags, safety kit includes headlight High Beam Assist (HBA), Driver Attention Warning (DAW), Lane Keeping Assist (LKA) and Forward Collision Warning with Forward Collision-Avoidance Assist - City (FCA). And on top of that, Lane Following Assist (LFA), fitted as standard to ‘First Edition’ DCTs. When in Cruise Control, this tracks vehicles in front of in traffic and identifies appropriate spaces in other lanes to move in to safely to gain more ground in heavy congestion. It detects road markings to keep the Ceed in its lane on the motorway, and controls acceleration, braking and steering depending on the convoy of vehicles in front. It uses external sensors to maintain a safe distance from the vehicle in front at between 0 and 81mph. You still have to drive the car, of course, and it feels a bit weird. The jury’s still out on that one. And then we get to the clincher. 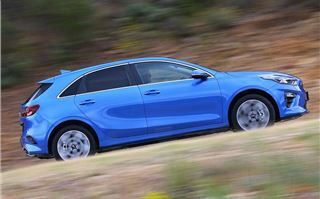 Whatever the finer points of competitors such as the new Ford Focus, the Mazda 3 and the Volkswagen Golf, they all come with mere 3 year standard manufacturer warranties. The Ceed is manufacturer warranted for 7 years or 100,000 miles at no extra cost. More than twice as long as the others. Some people might call that a “no brainer”.